Creativity and desire to learn, it's our mission. It is with honour, love and hope that we have builtour pedagogic concept. We are proud that since nine years we have beenobserving children grow and acquire wonderful life experiences. We teach themto know each other, we give them the pleasure of discovery and we teach them respect.We have a mission together with the parents and we work on it every day withlove. Our hope is to give each child the possibility to now succeed at schooland afterwards at work. . We would like to see all our children becomeresponsible citizens tomorrow. Kids’Ville is located in Beggen, between Kirchberg,Walferdange and Luxembourg City. Beggen is a multicultural zone, constantlygrowing demographically. Kids’Ville is housed in a building of 850 m2,enrolling 57 children from 0 to 3 years old ; from Monday to Friday 7h-19h andfrom 12h to 19h for school-going children. 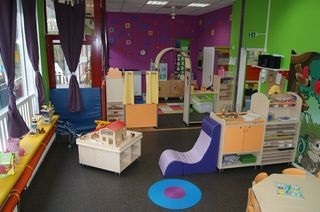 A daycare for children over 3 yearsis provided on Saturday from 10H00 to 17H00. 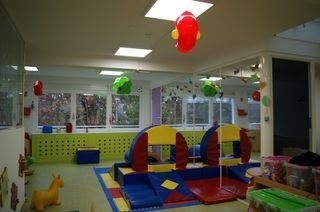 The building is divided into two sections: childrencare with under 2 years old and another for children over 2 years old. Thefirst section consists of spaces dedicated exclusively to babies between 0-24months with a sensory space, books, cocooning corner, sleeping room and a kitchenette. We have created a transitional space for children from24-30 months, to facilitate their transition from the toddler group to the over2 years children group. This space offers a complete set of equipment andfurniture dedicated to this group, with a psychomotor space, a reading cornerfor relaxation and cocooning. We have a second kitchenette where we have optedfor functional furniture for children, so that they can safely and actively participatein cooking activities. 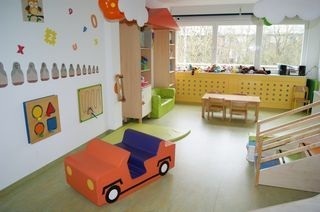 The care for the children over 2 years old is based indifferent rooms with dedicated activity: creative, free and symbolic games,construction games and role-playing games, as well as artistic activities.Reading and cocooning spaces are also set up between the different rooms wherethe child can relax on the sofas. This section also has a large indoorplayground, a place dedicated to physical activity and psychomotor development.During the day, children can also use a large outdoor playground with plenty ofgames. Our venue also hosts an "Animals and Nature"room, where our rabbits, fish and parakeets live. In order to involve the childin nature discovery and environment protection, this room is also a place for experimentsand plant culture. We are keen on environment protection so employees andchildren are directly involved in a sustainable development programme byparticipating daily in the waste collection. We are actively minimising wasteand advocate against over-production of waste, and our manual activities arecarried out using recycled materials. We have received the SuperDreckdsKeschtlabel for our responsible behaviour. Child development starts with a global physicalcapacity followed by a manual or language ability. We follow and respect eachchild’s rhythm by adapting appropriate stimulation for their development so thateach child can use his abilities and develop his personality. In the context of hospitality and services tofamilies, Kids’Ville is always open to suggestions, taking into considerationthe parents’ personal and professional requirements to find the most suitablesolution to satisfy their needs. Kids'Ville wants to be a partner for you,parents, by ensuring the care and the education of your children.